Katie Hyslop, The Tyee, March 6, 2014– In a letter to the editor sent to the Creston Valley Advance on March 5, Melanie Joy, a trustee for the Kootenay Lake School District and former chair of the BC Public School Employers Association, said the provincial government bargained in bad faith during the 2011-12 teacher collective agreement negotiations. “By my firsthand recollection, government tactics concerning the Bill 28 reconciliation sessions, and collective bargaining between the BCTF and BCPSEA, were accurately described in Justice Griffin’s BC Supreme Court ruling when she concluded, “Government thought that a teachers strike would give the government a political advantage in imposing legislation that the public might otherwise not support. In 2012, the provincial government introduced the Education Improvement Act, which prevented teachers from negotiating class size and composition limits until after an agreement had been signed, instead setting government’s own class size limits. It also installed a mediator — Charles Jago, a BC Liberal Party donor and author of a 2006 BC Progress Board report that said the province’s education system was “constrained by legislated processes and provisions as well as by labour agreements” — to help reach an agreement between the teachers’ union and its employers. Joy said the employers’ association and Jago tried their best, and succeeded, in reaching a negotiated deal. But government was disappointed with the effort. Minister Fassbender’s public statements about wanting to reach a long-term negotiated collective agreement in the current round of bargaining is undermined by government’s actions in this area, said Joy, referring specifically to government’s replacement of the employers’ association’s negotiating team this past summer with one government negotiator. Given the ongoing teachers strike action vote, Joy concluded her letter by advising the government to heed Justice Susan Griffin’s recent decision on the unconstitutionality of the Education Improvement Act. Read her entire letter here. Results of the union’s strike action vote will be announced at a BC Teachers’ Federation press conference tonight at 9:30 p.m.
BCTF News Release, March 6, 2014– A total of 26,051 teachers voted yes in a province-wide vote conducted March 4–6, 2014. 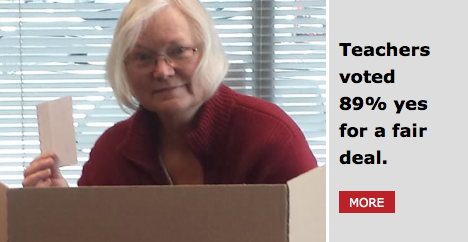 In all, 29,301 teachers cast ballots, of whom 89% voted yes. “With this vote, BC teachers have sent a very clear message to the BC government; it’s time to negotiate in good faith, take back the unreasonable proposals, and offer teachers a fair deal that also provides better support for students,” BCTF President Jim Iker said. In releasing the results, Iker stressed that there is no immediate action planned. “There will be no job action tomorrow, there will be no job action next week,” Iker said. “Teachers now have 90 days to activate the strike vote with some sort of action. There is no set timing for when we will begin. It will depend entirely on what is happening at the negotiating table and whether or not the government and employers’ association are prepared to be fair and reasonable. affect report cards or communication with parents. Any initial job action will be administrative in nature and have no impact on student learning. If, at some point talks stall or government does not move on key areas, that initial job action could escalate into rotating strikes. Once again, it depends on events at the negotiating table. There will be no full-scale walk out as a result of this vote. Such action would require another province-wide vote of the BCTF membership. Consistently for well over a decade the British Columbia Teachers’ Federation (BCTF) has stepped up for labour leadership, and thereby opened opportunities for every worker in the province. This has meant taking hard stands at the bargaining table, strike votes, job action, and strikes. At each moment this meant giving time and giving up wages so that other and future workers benefit. At each and every step the BC Federation of Labour (BCFED) was there with the BCTF, sitting, standing, and walking beside the teachers. This time is no different as the teachers stand up once again this week to take a strike vote against unfair labour practices. Make no mistake, a month after a BC Supreme Court finding of the BC Liberals’ underhanded and unfair labour practices, this is a no confidence vote in the Ministers of education and labour if not the government itself. Nearly a decade since mobilizing workers into a general strike capacity in the province, it may be time once again for the BCFED to mobilize a Day of Action. More than 1993 and 1994 or 2004 and 2005, worker and student discontent in BC is boiling over. The BCTF is once again adopting a leadership role and we can expect the BCFED and workers in the province to share in this current stand against unfair labour practices. BCTF, March 4, 2014–After a full year of bargaining and more than 40 sessions at the table, BC teachers have called for a strike vote to push back against major concession demands, an unfair salary offer, and a deliberately confrontational attempt to reverse the recent BC Supreme Court decision on class size, composition, and staffing levels, said BCTF President Jim Iker. Iker said he was incredibly disappointed and frustrated as teachers have worked hard this round to create a sense of calm and purpose at the bargaining table. While the last round was dominated by government acting in bad faith, this time teachers were hopeful that new players and a new framework agreement would help both parties reach a fair and reasonable deal…. Once a strike vote is taken, a union has 90 days to activate it with some sort of job action. 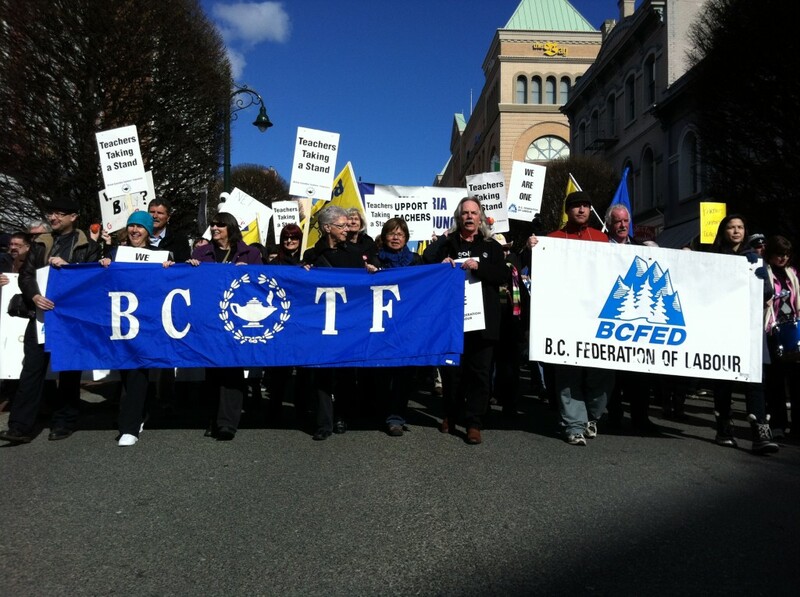 The BCTF strike vote will take place on March 4, 5, and 6, 2014. Results will be announced on the evening of March 6.
include immediate school closures or disruption for students. stop teachers from participating in extracurricular activities. Any escalation of job action will depend on progress at the negotiating table.